(NDNG) -A change in leadership within the North Dakota National Guard’s Land Component Command (LCC) took place Sunday during a change of command ceremony. As the current LCC commander, Brig. 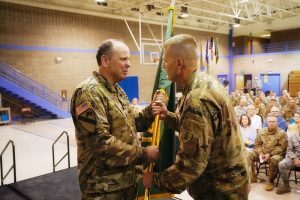 Gen. Robert Fode handed-off the duties of overseeing the state’s nearly 3,000 Army Guardsmen to Col. Leo Ryan at the Raymond J. Bohn Armory in Bismarck. Fode, who will retire in October, has culminated a four-decade-long military career. A native of Mobridge, South Dakota, he enlisted in the N.D. Army National Guard in 1978 as a motor transport operator. In 1985, he was commissioned as a second lieutenant in the engineer branch after attending Officer Candidate School. 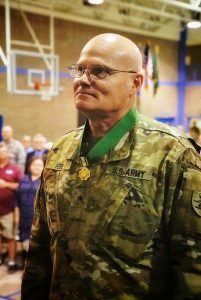 He has held myriad key leadership positions throughout his career, including serving as a platoon leader, executive officer and commander within units of the 164th Engineer Battalion. Additionally, he served as the operations officer for the 142nd Engineer Combat Battalion. A traditional Guardsman, Fode is employed by the N.D. Department of Transportation. He has worked for the agency since 1993 and currently is the director for the Office of Project Development.